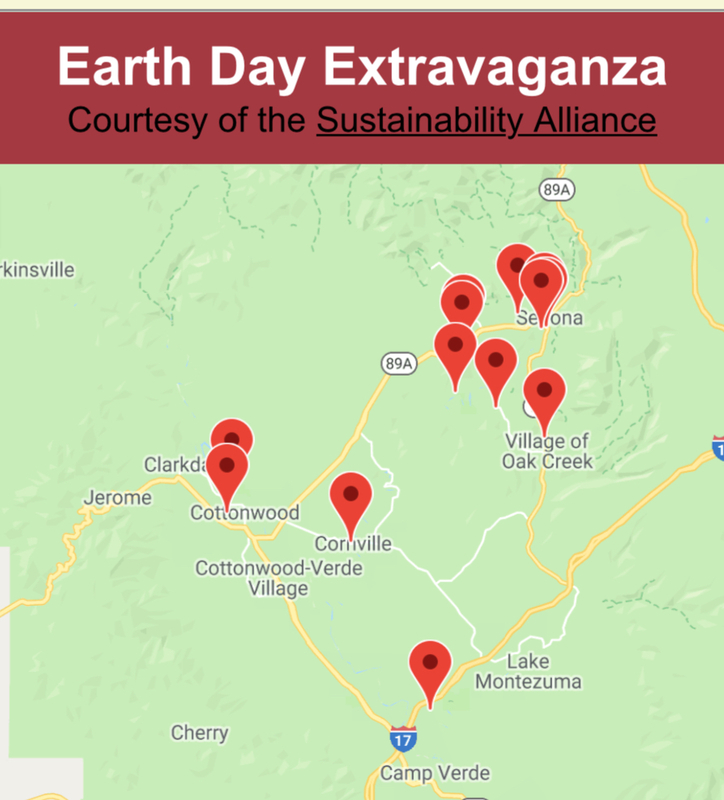 SUSTAINABILITY ALLIANCE: What do Arizona school teachers want regarding sustainability? 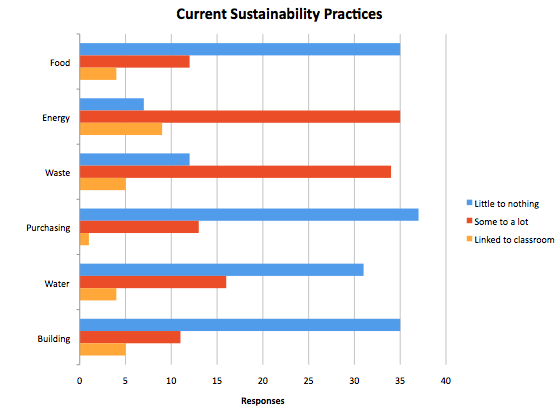 What do Arizona school teachers want regarding sustainability? 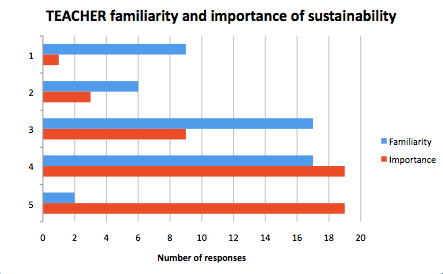 This paper compiles the findings of a Sustainability in Schools teacher survey in Arizona during January 2015. 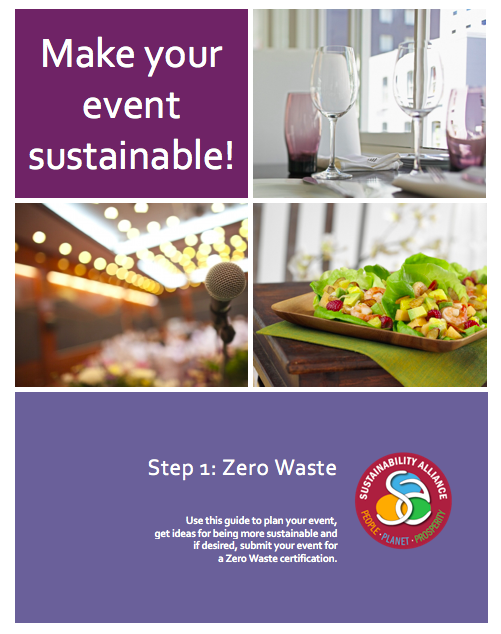 The survey was administered by the Education for Sustainability program under the Sustainability Alliance. Here we see the same relationship as that of the administrators where the familiarity is somewhat less than the perceived importance. 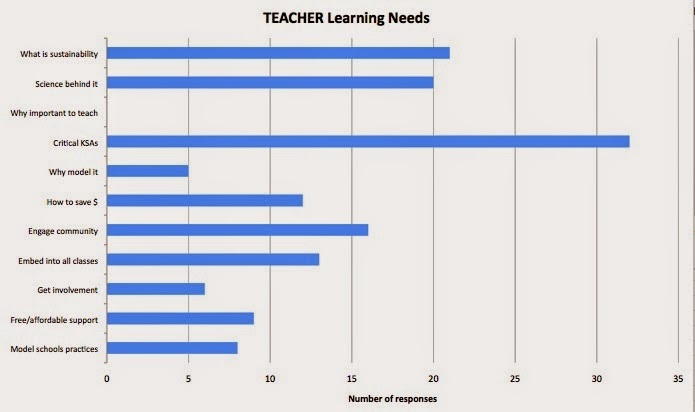 However the teachers rated it higher in importance than administrators did. 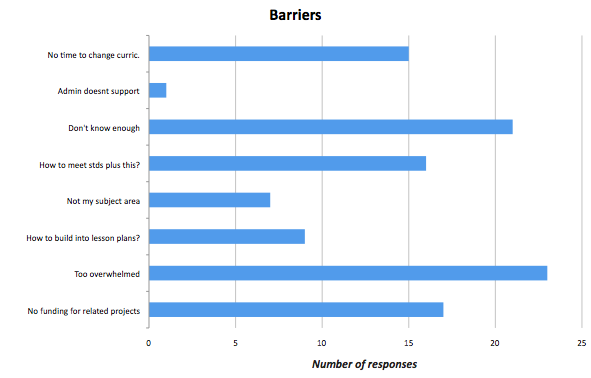 Lack of knowledge about sustainability and general sense of being overwhelmed were the biggest barriers. Notably, it appears teachers have the support of Administration. The teacher learning needs show that teachers already understand why it’s important to teach (and to a lesser extent) model sustainability practices. Their biggest need is to know what the critical skills, knowledge and abilities are. This should be answered by June by a worldwide convening of thought leaders. 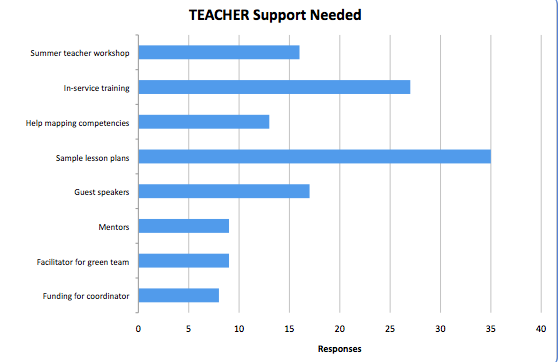 The largest request for support was for lesson plans and materials, which echoes the Administrator survey. There is also a preference for in-service training rather than summer workshops. Most respondents felt their schools were doing little to nothing regarding sustainable operations however a number of respondents thought their schools were doing quite a bit, with Energy being the largest category. A subset of those also used these practices as a teaching tool in the classroom. 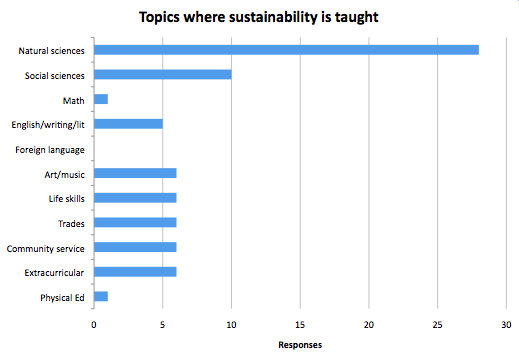 Not surprisingly, sustainability related content was most commonly taught in natural sciences but a significant number of respondents indicated they also taught related content in almost all other subject areas except foreign languages. Comments included in the open-ended question. What else would you like us to understand or do to help you? I fear that unless your concepts are linked specifically to CCRS or to Beyond Textbooks, you will have difficulty having schools adopt such practices into classrooms no matter how important they are. I would like to make sure that this is not simply a "climate change" initiative and topics like leadership, civic participation, and other socially relevant topics are addressed. Most of our teachers have no time for anything else. We all have a great challenge just trying to keep with our current duties (teaching, prep, meetings, teacher duties, and extra-curricular obligations. We cannot add another item. It will have to be a trade. I don't know what sustainability is. We had a teacher last year that took the lead in getting a garden going. Since she left I don't know of anyone who has taken the lead in continuing what was started. I do know that there were outside organizations that helped get it started and our school PTO helped purchase a few things for the garden. I'd like to see it continue and thrive. We need training to implement this within our school. installation of water stations where students refill there water bottles which helps them stay hydrated and also helps the environment by keeping thousands of plastic water bottles out of our local landfill. Integrating Earthship construction into our curriculum. Any way to supply teachers with curriculum would be helpful. We are constantly reinventing the wheel, and become overwhelmed with curriculum development in heavily tested subjects. I would love to focus even more on sustainability, but I need help with preparation. This is a subject I am very passionate about. I taught at a school in Colorado which included sustainable living in daily activities and lessons. If funding were made available, I would really like to be involved in implementing a program at my school. I think this is an amazing idea and essential learning for students. I'd like to see sustainability integrated at the earliest possible grade level. Our time is quite limited. We do participate and want to be more involved, but time is a limited resource for our staff. Any help would be greatly appreciated and respected! We have established a school garden, 200 tree orchard, compost from our food facility pre and post service, teach greenhouse growing techniques, and have funding for a two year expansion of our projects. We are also looking at opportunities to support educators pursuing sustainability initiatives. I would like more ideas on integrating it into the curriculum and supplies to continue projects. Currently we are doing a lot of projects with pallets in Agriculture Science and Agriculture Mechanics. We have made planter boxes for our awards banquets and for the students to take home to grow plants in. We have also made two display boards out of the pallets, one was a tri-fold that was used for our Floriculture Career Development Event Display where the students created a window display around the theme of Graduation for the contest. Then we also made one for the Agriculture Mechanics shop to display projects on for the community to buy. We have also been collecting the large food cans from the cafeteria and using them as small plant projects projects, feed cans for animals and decorations for our events. Our next hope is to start composting using the thrown out food from the cafeteria, currently we do not have a spot to keep it but we do have land that as soon as it is cleared will have space to have large compost piles to use in our gardens and greenhouse. We need bins for the cafeteria and students to use for recycling as well as supplies to increase our garden.